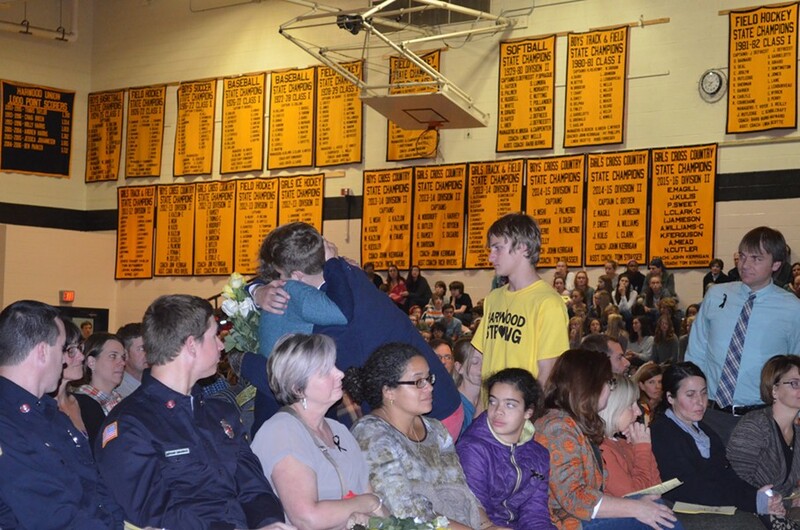 Eli Hammond hugs Cyrus Zschau’s parents as Seth Beard, wearing a Harwood Strong T-shirt, looks on. The five high school students were killed by a wrong-way driver on their way home from a concert on October 8. 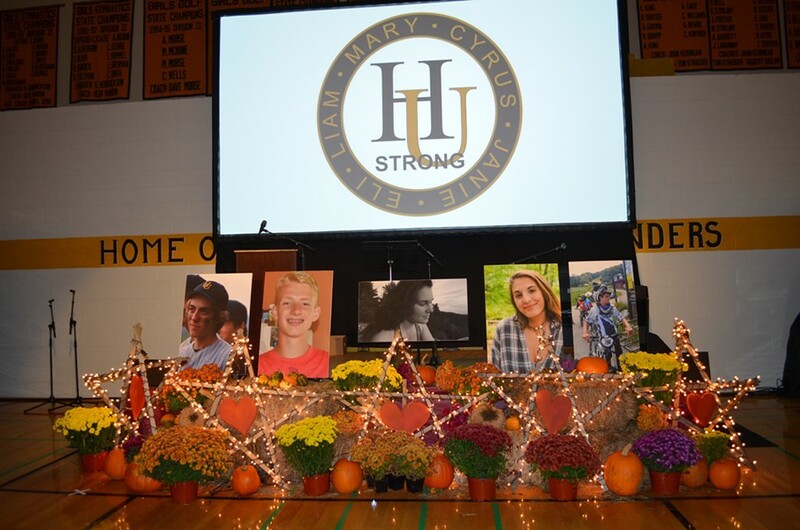 The Harwood Union High School gymnasium was packed Monday night for an event held to honor the teens. Their classmates filled the wooden bleachers, using one another as back rests, and an older crowd occupied the hundreds of folding chairs that had been set up on the gym floor. The stage was a shrine to the students, with poster-size photos and five wooden stars wrapped in strings of lights, propped up by hay bales and potted flowers. 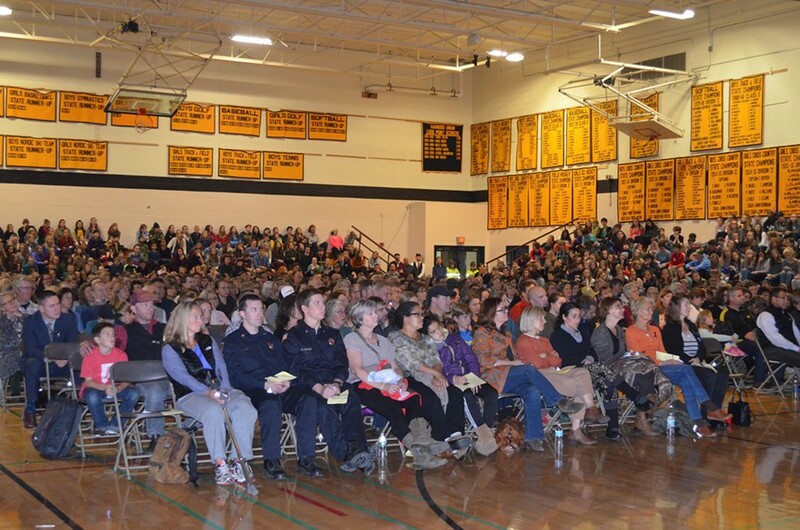 Sitting among the families of the students who died were two youthful-looking Williston firefighters — A.J. Leclair and Tony Simanskas. Both men responded to the crash. Harwood coprincipal Lisa Atwood started to ask the crowd to give them a round of applause, and the entire room was standing before she could finish her request. At the end of the night, some of the fallen students’ closest friends walked over, one by one, to shake the firefighters’ hands. Jonah Ibson, who taught Brookens English, read an essay Brookens had written — from the perspective of a pair of underwear. Green was at the Higher Ground concert with Harris and her friends on the night of the crash.